Cold water entering the geyser descends in the panel. In both the insulated collecting tank and in the solar panel, the water heated by the sun rises by convection to the top. Water movement is shown by the blue and red arrows. Water then rises in the panel as it is heated, and it feeds into the geyser. The hottest water in the geyser rises to the top. Usually, solar geysers have an element to boost the water temperature when required. This can be done once or twice a day. We advise the fitting of a timer, so that the element is switched on only at specific times to boost the temperature of the water in the geyser. 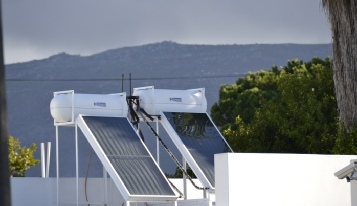 A solar pump may be added to an installation to regulate the water flow, thereby increasing efficiency. 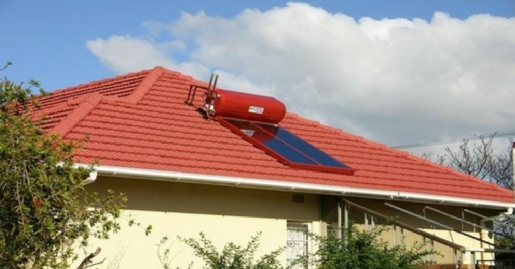 Your solar geyser can be installed internally, or externally. If your home has a flat roof, we use galvanized stands to mount panels at the correct angle, as shown alongside. What Happens When The Weather Is Rainy Or Overcast? We advise our customers to fit a timer to the solar system and to have the back-up element switched on only at selected times. However, on rainy days, more will be required of the element, and it will need to be used for longer periods of time. If you have a normal, high-pressure geyser, we can make changes to the water movement in your hot-water system, so that water will be heated by the sun before it enters the geyser. Photo-voltaic electric cells and a solar pump are used in this operation, which is called retrofitting a geyser.